Here's another one of those comic strips that ran in farm publications. This one is by the team of Madsen and Entwhistle. I have no idea who these guys are, but the art and gags are pleasant enough. The strip ran at least 1947 through 1952, and perhaps much longer. My samples are from the snappily named Wisconsin Agriculturist & Farmer, but it may have been appearing in other farm papers as well. 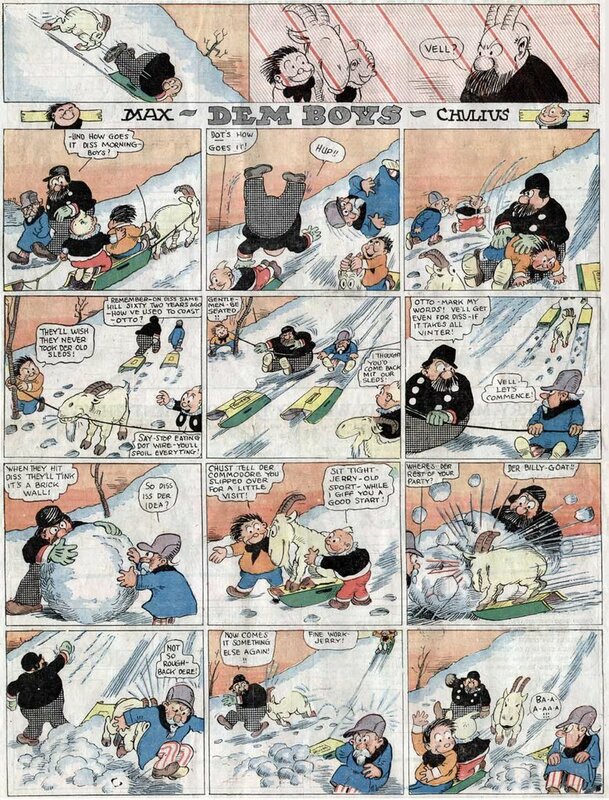 Can anyone contribute more information on this strip or its creators? 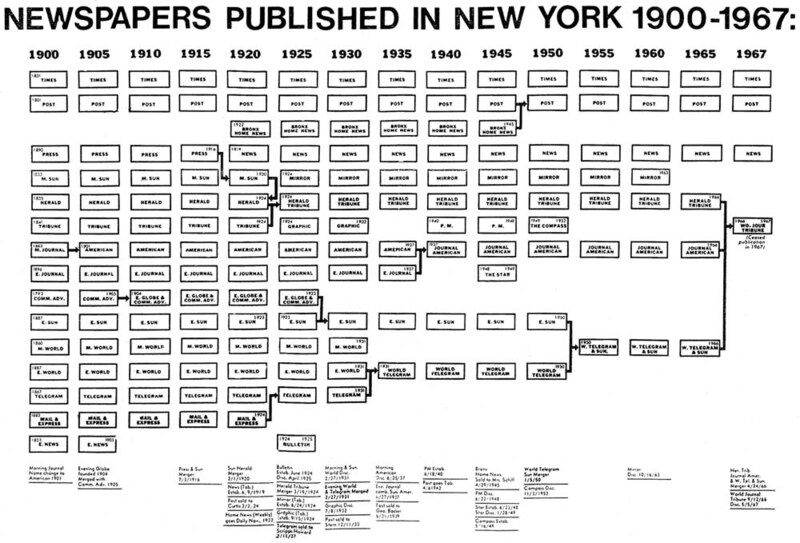 My hat is off to anyone who can keep straight all the newspapers of New York City. I know I can't. 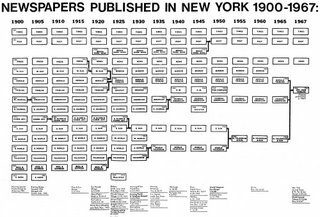 This nifty little chart shows a complete capsule history of the comings and goings of New York City papers for 1900-1967, and I for one couldn't live without it. Anyone doing research on comic strips, for which New York is the eye of the storm, will find this invaluable. I wish I could give credit to whoever created this thing, but I got it second-hand as a photocopy (I can't even remember who gave it to me; perhaps Jeffrey Lindenblatt?). If anyone knows where this was originally published, please let me know so I can give proper credit. The image here, even at full size, is still quite small. If anyone would like a larger TIF scan suitable for printing please email me and I'll send a copy to you. Newspapers" with, say, "C. W. Kahles"? Here I go to all the trouble to weave a proof that would satisfy Kant and Wittgenstein, an argument so bulletproof that not even Plato would stand a chance in a debate, and here comes that Castelli fellow with this ever so inconvenient item shown above. Some people just caan't leave well enough alone. So here's the deal. Alfredo sends this scan, which shows Dem Boys running in February 1915, and thus not only demolishes the whole argument that the strip started in November 1915 or later, but also may call into question the idea that they took over the space previously occupied by Anna Belle and Duke. Alfredo, do you have the whole section? What else is in there? Thankfully, Alfredo's tearsheet includes a masthead, and even better, the Cleveland Leader is a paper that I should be able to obtain through inter-library loan. However, I am currently hobbled in my microfilm activities. The dear sainted Rita who handled my voluminous ILL requests at the Leesburg Public Library has left their employ (quit to raise a family without even getting my assent!). The person who has temporarily taken over her job, and who was trained in the arcane arts of ILL by Rita before she left, has made it obvious through her resolute inaction, that she has no interest in keeping me supplied with 'film. Supposedly the library is looking for someone to fill Rita's post, but its now been four months since she left and nothing has happened. I fear that I may be permanently frozen out from getting my regular ILL fixes. Doubly annoying considering that I have donated most liberally to the institution over the past few years in appreciation for their services. So Alfredo, and other blog readers, I promise to look into the Dem Boys issue as soon as I can and report my findings. By 1915, the World Color Printing syndicate seemed to be running on fumes. 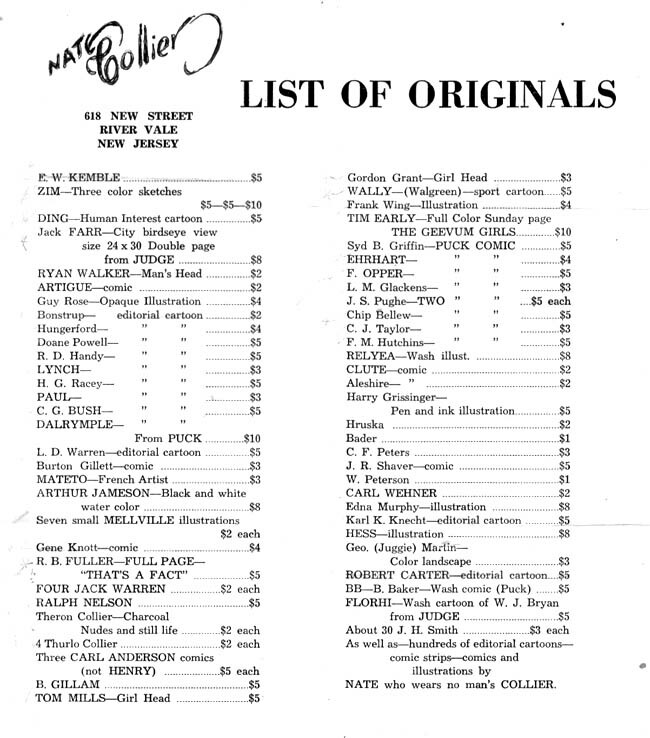 They still had their great Slim Jim feature for the front page, but the interiors of their 4-page color comics section had been reduced to running reprints of Philadelphia Press features from the early teens. The back page had the long-running paper doll feature Anna Belle and a strip titled Duke featuring a horse. Both these back page features disappeared abruptly on November 14, 1915. They were replaced either immediately or soon thereafter by a new full page feature titled Dem Boys. The feature was occasionally signed Karls, but was most often unsigned. Looking at the sample above, its about as obvious as can be that the strip was an unabashedly exact copy of the Katzenjammer Kids. Now there's no denying that there was plenty of this sort of thing going on in the early days of comic strips. For every successful strip, there were plenty of cartoonists trying to duplicate their success simply by copying the formula. Dem Boys, though, may be the most egregious ripoff ever. The character designs are so close to the originals that if you changed the names of the characters, the casual reader would surely think they were reading a Knerr or Dirks strip. What is perhaps most interesting is that the series ran for a long time, until at least sometime in 1918. Surely if there weren't already two 'legally' competing versions of the Katzies, the hammer of the Hearst or Pulitzer legal departments would have fallen quickly on Max and Chulius. But I suppose it would be hard to make a legal argument that Dem Boys was unfairly stealing the plot and characters of the original, when there were two originals! I have no exact running dates on the strip. My files of World Color Printing have some long gaps in late 1915 and 1918. Regarding the starting date, I do know that the prior features that used that space ended 11/14/1915, so a seemingly likely starting date is 11/21. On the other hand, Cole Johnson in StripScene#19 states that the strip began on 2/20/16. Cole is a researcher par excellence and I find it rarely fruitful to dispute his pronouncements. On the third hand, Alfredo Castelli in a draft of his forthcoming book claims a start date of 11/29/1914, which seems highly improbable unless there were multiple versions of the World Color Printing section in circulation (I don't believe that is the case). On the end date, the best Johnson can come up with is "late 1917 or early 1918", while Alfredo Castelli cites 3/2/1918. Since I have samples as late as 3/17/1918 that can't be right. 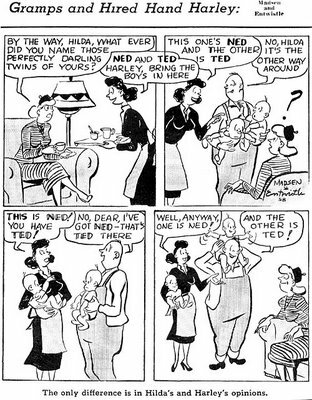 The strip that presumably took over for it, The Kelly Kids, is not known to have started any earlier than December 1918. So somewhere in there is the best I can do so far. Can anyone help? Update, 6/1/2013: Since this post was made, additional info has come to light. It appears that Dem Boys may have originally been a local feature of the Cleveland Leader before it was picked up by World Color Printing (or by McClure, as another bio claims, but which I doubt). According to my microfilm resaerch, in the Leader it started 6/28/14, long before any WCP or McClure section seemed to be running it. There is also talk of a daily version of the strip, but I did not see evidence of it (though at the time I hadn't heard this claim, so I wasn't necessarily looking specifically for it). Also, according to various sources, 'Karls' is actually Ralph Hershberger. Since Hershberger was active into the mid-60s at least, though, the timeline seems a little strained. Does anyone have a birthdate for Ralph? In all my years of collecting I never came across the magazine StripScene. Can you what it is/was? Frankly I don't remember where i got the 1914 date: shall check my tearsheets soon or late, or maybe I just copied a date badly. I do have a tearsheet from the "Cleveland Leader" from Feb, 7, 1915 (I'll send a copy to your private E Mail) which is a much earlier date than the ones in the blog; consider that this doesn't seem a "first" page, where the characters are usually intriduced, but a page from an already running series. So a Nov 29 1914 date (i.e. 9 weeks before before) is not SO impossible - For what concerns the ending date, you're right, of course. (only stapled, if I remember correctly). Ray Reistoffer, Henry Yeo and others. StripScene was by far the best comic strip fanzine ever put out. Edited by Carl Horak, important contributors were the Johnson brothers and Ken Barker. You definitely want to get the run (thru #25) if you get the chance. I dont really know if this is related to your discussion ? 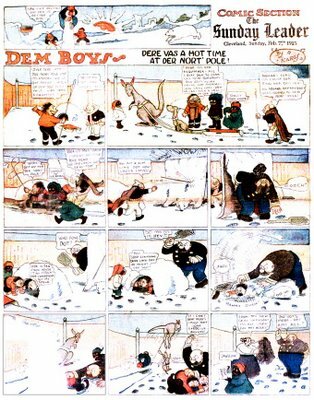 BUT, I have an original colored comic strip of the Shenanigan Kids dated 1919 by Knerr. I just posted an example from 1915 of "The Kelly Kids" on flickr. 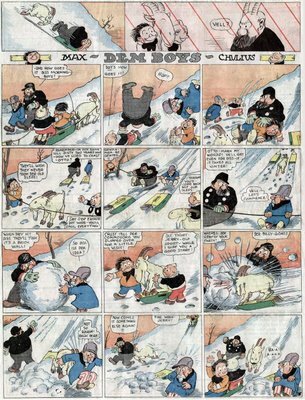 Based on the look of the Hank and Kelly Kids pages you posted, these are almost certainly World Color Printing rerun versions from the late 1920s. 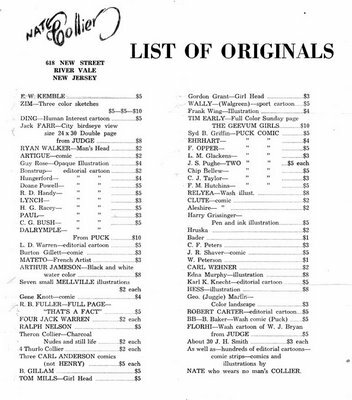 The Hank one might well have a copyright line from 1916, but I REALLY doubt the Kelly Kids is dated 1916. The pics are way too small to verify that, of course. Howzabout a close-up? Right you are! It does bear a World Color imprint, and upon closer perusal of the ads, one can see that the Renn Motor Co. was offering the new Chrysler Plymouth which wasn't introduced until 1928. That'll teach me to trust dates! Not sure if this helps or is applicable, but in a biography on Ralph A. Hershberger printed in he Sesquicentennial History of the Berlin (Ohio) Community, it says Hershberger drew the daily "Dem Boys" under the pen name of "Karls" for the former Cleveland Leader, and the comic was distributed by the McClure Syndicate. Ralph A. Hershberger was born on December 18, 1890 and died March 6, 1970. Looks like he lived out his life in Ohio. In various censuses he listed his occupation as: art director (1920), cartoonist (1930), and artist (1940). Annibelle began life on 12/29/1929 as a single tier strip that ran on Sundays in NEA's Everyweek magazine section. The strip ran on the womens page of the section. 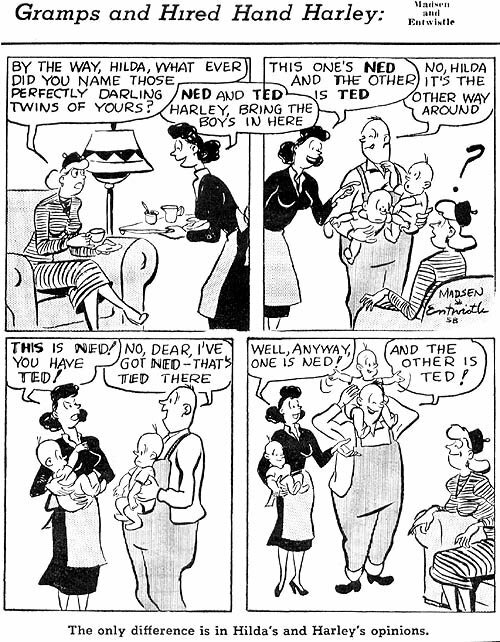 The cartoonist was Dorothy Urfer. Urfer had a blotchy, ink-stained style that worked out alright in the black and white version, but wasn't especially suitable when Annibelle made the jump to the colored comic section in 1935. In March 1936 the strip was taken over by Virginia Kraussmann. The strip had no continuity, and the gags were of a catty, gossipy type that sought to emulate the conversations of the rich and spoiled debs of the day. These were the same young aristocrats seen in hundreds of Hollywood movies in the 20s and 30s. Kraussmann apparently had some ghosts or assistants helping out, because the quality of the artwork varies considerably from week to week. I've picked examples with better artwork, presumably those in which Kraussmann took the most charge. Annibelle last ran on 10/15/1939. Someone from the Isle of Man is trying to find out about Frank Tipper, aka "Mugsy Tipper" who was from the IOM and died in Los Angeles County in 1963. Tipper was an animator (not a strip artist) and worked for Walter Lantz Studios, et al. If you have any idea where we could find out more about Frank Tipper, please let me know. At least we know these should be in circulation. That should make the ultimate cartoon collector's 'treasure hunt'. To find each of these cartoons. I've been through the Cullman Banner now, and I never saw a Nate Collier piece there, at least I don't recall any. You sure about that? Look for the political cartoons. I believe it was in the Cullman Banner... or was it one of the other two I have been looking at? Let's have a look... I have found one in the Perry Chief Advertiser for jan 23 1941, which I am sending you.